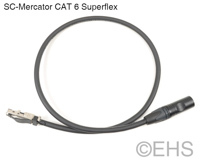 This is our custom-built top quality CAT 6 superflex cable with Sommer Cable SC-Mercator CAT6 Pur Superflex wire. Termination is a selection of high grade RJ-45 connectors and Neutrik EtherCon connectors. The cable is a super flexible CAT6 shielded cable which is super thick and heavy-duty. It has 23awg solid conductors, a braided shield, and dual PVC jackets. This cable is very durable for live sound and lighting applications and has the flexibility for day to day use. Photo 1 shows 3 foot cable with one Ethercon and one RJ-45. Photo 2 shows the two ends with one Ethercon, and one RJ-45.